Baylie is a 16 year old Junior at Beyer High School and is on the cheer squad. A little background about Baylie's family. Baylie has three brothers; Brandon (19), Derek (16) and Jacob (11). They are all being raised by their single mother, Season Newell. Season worked as an EMT with ProTransport until she sustained a shoulder and ligament injury. She keeps her certification up as she wants to return to the field. Season is currently employed with the Stanislaus County Health Services Agency in the Pediatric Office. In January 2017, Season was diagnosed with Stage 2 Melanoma. She was then diagnosed with Intermediate Stage 2 Thyroid Cancer in May 2017. She underwent treatment which concluded at the end of September 2017. Season is currently undergoing maintenance treatment at UCSF to keep the cancer cells at bay. Season was just recently diagnosed with Castleman's Disease. 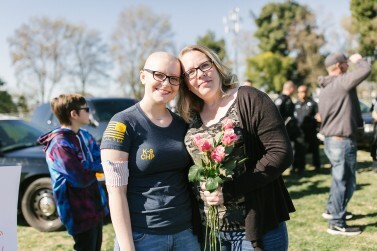 She has appointments scheduled at UCSF to fight the new diagnosis. Baylie has dreams of becoming a Police Officer, specifically in the K9 unit. Through all the family hardships, she has stayed in school and is still able to participate in cheer. In October 2017, Baylie received news that no 16 year old should ever get. She was diagnosed with Hodgkins Lymphoma. Baylie travels to UCSF every other Tuesday for chemotherapy. She has 12 rounds of chemo scheduled. Baylie is unable to attend school due to chemo because it makes her very sick after treatments. On days she does not have treatment, she is able to attend outings if she has the strength and ability, however that is not very often. She is a huge fan of the Oakland Raiders, specifically Derek Carr and former player Charles Woodson. Her favorite colors are pink and blue. After hearing the story about Baylie and her family, I wanted to put a very special day together for her. Season reached out to set up a ride along for Baylie. However, we wanted to make it a much bigger day for Baylie. Baylie has no idea this is being planned. To watch the video of special day we planned for Baylie, click the link below.